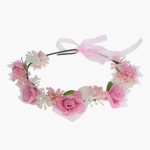 Look effortlessly stylish by wearing this charming headband. In pleasant pastel shades, it flaunts an attractive floral silhouette. Team it with your favourite garbs for an ethereal appearance.